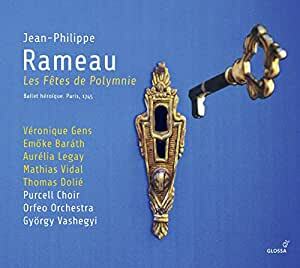 This recording of Rameaus Les Fêtes de Polymnie (1745), directed by György Vashegyi, features Aurélia Legay, Emöke Barath, Mathias Vidal, and the incomparable Véronique Gens in the various vocal roles that appear in the works Prologue and three Entrées. Rameau, aided by his reformist librettist Louis de Cahusac, conjured up in addition to sparkling arias and recitatives a dazzling mosaic of intermèdes, passacailles, chaconnes and descriptive symphonies interspersed with vivid choral contributions, delivered with taste and aplomb by the Purcell Choir and the Orfeo Orchestra. 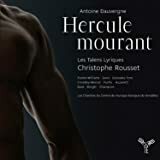 A nice addition to the list of Rameau's operas that are being performed and recorded. Although this particular work was once criticized in Rameau's day as not being one of the composers best pieces, it is by no means short on musical brilliance, splendor and many beautiful moments, and contemporary views have pointed out that it is actually a shining work for the marvelous choruses and sparkling dances. All the singers are strong and the orchestra plays with precision and verve. I'm always extremely pleased to purchase anything with Veronique Gens singing in the cast. The pace is perfect and I was sorry when it ended. 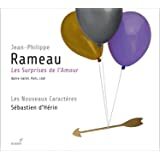 And if you are like me, you have always wanted to hear every one one of Rameau's operas and ballets which were not performed or heard so many years ago. I recommend it highly.